"Hey, Sunshine, want to go to see the Canine Olympics today?" she said with her usual smiling face. "I think you need a break from house hunting." And so it was. Simply arriving at the University of Connecticut's Depot Campus as my friend parked the car, I felt the excitement building as if I were a little kid. Anxious and exuberant, I joined the crowd around the fenced in area, which was strategically laid out with various obstacles. 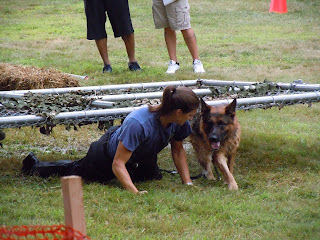 Our heads immediately turned towards our left as the announcer broadcasted the handler and partner names, along with a brief background on their accomplishments. It was then they bolted from the starting line. Submerging themselves into the muddy water, then up and over a huge elevated log onto the grass, they then dropped to the ground and crawled under the sprawling mass of mesh fencing. Emerging unscathed the handler, a fine young police officer, stood erect with her canine companion sitting attentively at her side. This particular pair was outstanding. The majority of handler's gave the commands in German. In speaking to one of the trainers he explained to me the importance of socialization referring me to a group who place the pups in a home for a designated time frame (1-1 1/2yrs). Yet, this was only the beginning as many other obstacles lie ahead requiring complete control of their dogs. Another integral part of the competition was, of course, catching the "bad guy". The handler approached with their partner commanding them to down stay fixing their eyes on every movement of the perpetrator. The dog was then released and given the command to attack. Once the command was given to release the culprit, the dog backed off and returned to the handler eagerly awaiting the next command. The officer approached the suspect, "cuffed" them before escorting them off the field, canine at their side. As you can see, I was more focused on the canines than the trainers. This dog with many years of service is due to retire soon, according to his long time companion/handler. He will begin again with another partner while this dog continues to reside with he and his family. Puppy in training...a potential candidate. Just another day in the life of a "working dog." Don't worry. This is a piece of cake! Love & affection counts too! Spectators of all shapes & sizes. This was such a welcomed and rewarding experience for me! I plan on attending every year. No matter what obstacles life throws at you, there is always a way to deal with it! This looks like so much fun! Such beautiful dogs! There is such a bond between officer and dog. Nice to see that the dog remains in the home after retirement from the force. I can see it now. 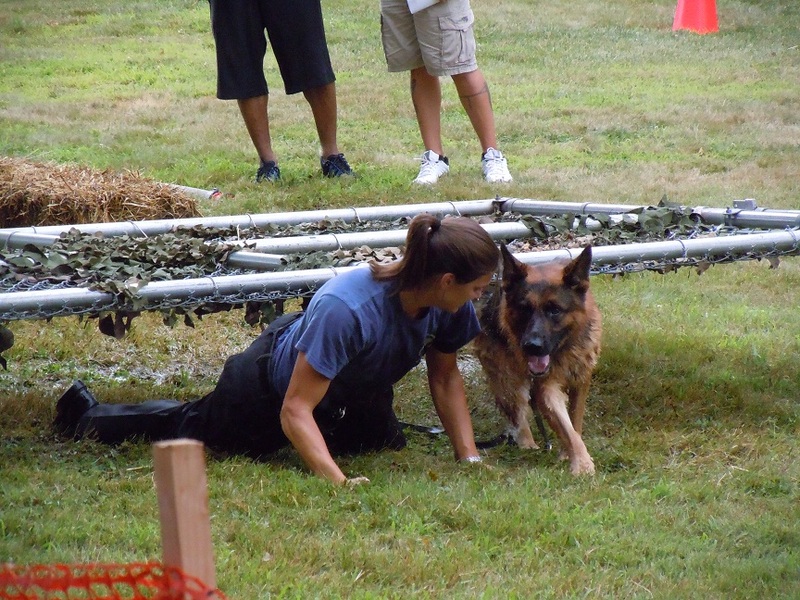 You are going to be trying to get your pups to do some of the things you seen the dogs do in the competition! hehehe It is amazing how smart a dog can be just by being trained by the right people. We seen a lot of K9 police and their dogs doing some kind of training when we were at Canaan this week as we drove by. Oh how I would have loved to go and watch that as well!!! Wish I could have seen it with you! What a wonderful way to take a break from house hunting. They are beautiful. I always loved watching dogs doing those obstacle courses. I once had the opportunity to watch some military police dogs doing stuff like that. It was amazing to see it in person! I have an award for you. Pop over to pick it up. Enjoyed all the pictures.. Great dogs and great show~! Glad you had some time to see them perform.